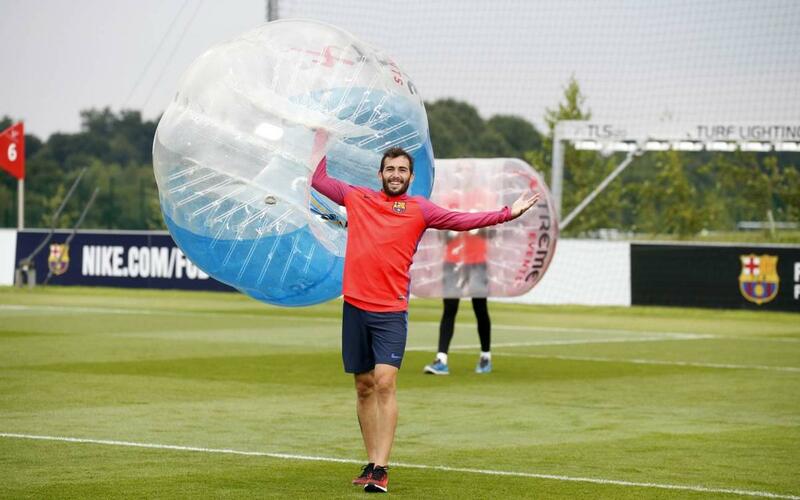 The FC Barcelona players had a whale of a time in their final training session at St George’s Park, Birmingham, when rather than a normal workout, they instead had a bash at the cracking new craze of bubble football. It’s a game in which the only rule seems to be that there are no rules, and in which off-the-ball tackles are not only legal but form part of the tactics! But instead of crashing to the ground, tackled players simply bounce around for a while before scrambling back onto their feet. Winning the game often takes second place in the list of priorities as players battle to gain revenge on the most mischievous of tackles – for which team-mates are often as much to blame as opponents! Two games were played: one between players and then one between the players and the coaches. Jolly japes were the order of the day as this great little video shows!